My digital agency opened its doors in January of 1996. Back then, there were no proprietary Content Management Systems. Microsoft was still dismissing the notion of the web as a viable platform for business or e-commerce activity. If a website needed functionality, unless we could find something at Matt's Script Archive to accomplish the task, we built most of it from the ground up in Perl. As time went on, we simply continued to ride the open source path. We assembled a huge collection of functional applications we had built for client sites that could be added to and modified for new ones. Shopping carts, contact forms, opt-in email list managers, employment opportunity listings, content editors, slide shows, all built as open source using PHP. A few years later came the emergence of Content Management Systems, which contained—as a package—many of the functional elements we previously had relied upon our own resources to create. Drupal, Joomla!, Wordpress, and others were emerging as the default new development platforms for most digital agencies who had followed the same path as ours. Then came platforms like Magento and Concrete5, which began with a view to eventually evolve into enterprise solutions with a price tag designed to achieve profit motives. But the initial efforts of their foundational community editions were still fueled by the passion of development communities who helped to develop the core functionality. 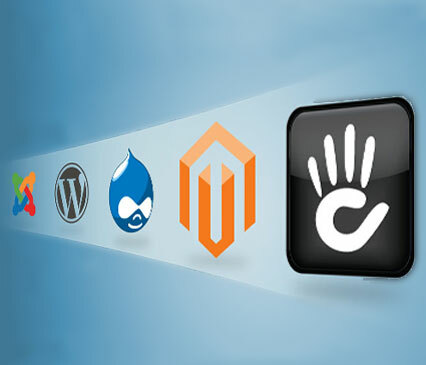 Along with them came a huge array of $5, $50, and $100 plugins and extensions to add custom functionality to meet almost any client needs. And because the open source model extended to those plug-ins and extensions, individual developers could make further modifications to meet even more demanding client requirements. And all of this was designed to run on license-fee-free Linux, Apache, MySQL, and PHP operating systems running on low-overhead hardware. The common thread was that all of these were—and still are—tools developed by people with a common purpose. That purpose was a desire to help the internet achieve its potential by providing individuals, businesses, and organizations with amazingly robust and fully functional, but still cost-effective, web presences. During this same time, several software companies used investment money to create expensive proprietary content management and e-commerce systems designed to run on operating systems and databases with enormous licensing fees, and requiring lots of expensive hardware. Total cost of implementation and ownership ran five to 10 times that of their open source counterparts. For the mega-corporations with huge budgets that are used to spending hundreds of thousands of dollars on just about everything they do, and that believe no credible solution comes without an equally huge price tag, it provides the opportunity for lots of money to change hands. That's fine if that's your business model. However, for a smaller digital agency, it's hard to start every web development project watching tens of thousands of dollars pass through from the client to the software companies just to create the development platform. That takes a lot of money off the table that could have been used to create more functionality, or pay for a year of post-launch support for inbound marketing and other enhancements. Additionally, the open source model has always provided us with the flexibility and customization possibilities to always provide the client with a user experience and backend functionality that adapts to their specific needs and business model. Many closed source proprietary systems do just the opposite, forcing the business to accept the rules and functionality limits built into the system. Smart digital agencies know that if providing value, return on investment, and total customization are all key components to their brand and value proposition, the open source model is, and has always been, the far better choice.